Although CPF Life is compulsory, there are those who will not be automatically enrolled. 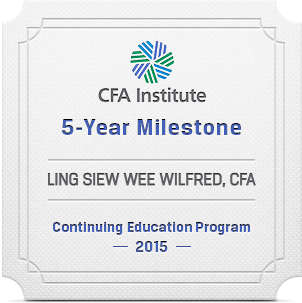 If your age and CPF Retirement Account meets the following, you will automatically be enrolled to CPF Life. Otherwise, you stay at the Retirement Sum Scheme. 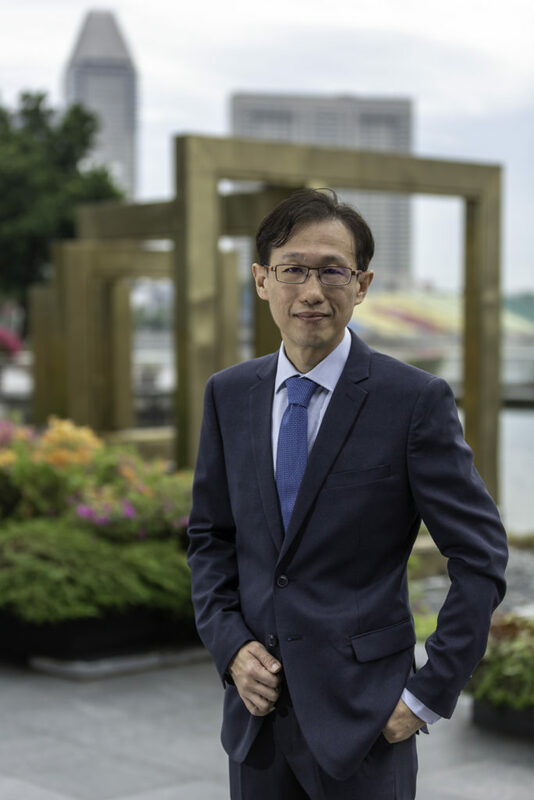 Under this scheme, the CPF Retirement Account will be drawndown on a monthy basis starting 65 (the minimum payout age) until up to 95 years old. Most people may be confused with the CPF Minimum Sum Scheme which was an older scheme with payout from the CPF Retirement Account is over 20 years. With the switch to Retirement Sum Scheme, it seems the payout was extended up to 30 years. Notice that in the above infographic, the 4% interest helps to fund the payout from 65 "up to 85". This implied that it may be less then 20 years of payout. Similarly, entire payout period is "up to 95" which implies it can be end before that. In other words, the entire payout period is 30 or less years. How does the extra interest fund the additional years? I believe that the CPF facebook page’s explanation is just a layman of saying that if it wasn’t for the extra interests, the payout can only last for 20 years. If this is the case, I ran another simulation. This time, I did not provide for any extra interest and assuming the monthly payout to still be $482. Looking at the excel simulation, the payout ends after 23 years. Hmm…. How much can 4% really give over 20 years? Upon requests from my readers and clients, I decided to compute the monthly payout assuming (1) 4% interest (2) no extra interest and (3) 20 years payout. Based on the simulation shown below, the monthly payout is $529.05. Should he opt for CPF Life Standard? At $86,727.75 and turning to 65 six months later, the CPF Life Standard Plan gives a lifelong payout of $512 to $540 every month with the assumed interest rate of 3.75% and 4.25% respectively. 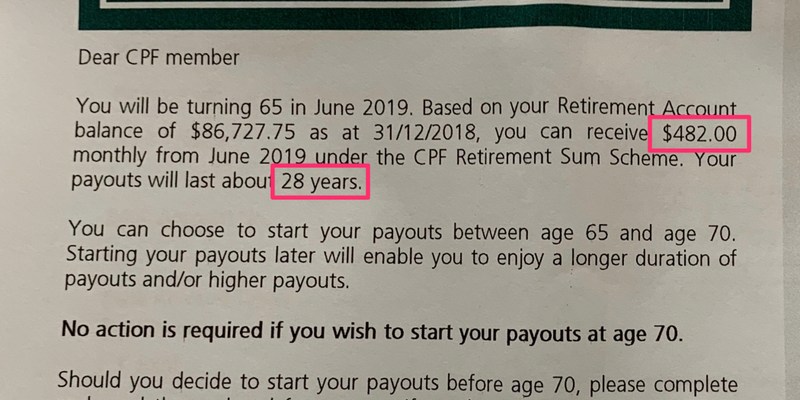 Therefore, in this case it makes more sense to opt for CPF Life since CPF Life's payout is already more than the default $482 (which last until 93 or 95). 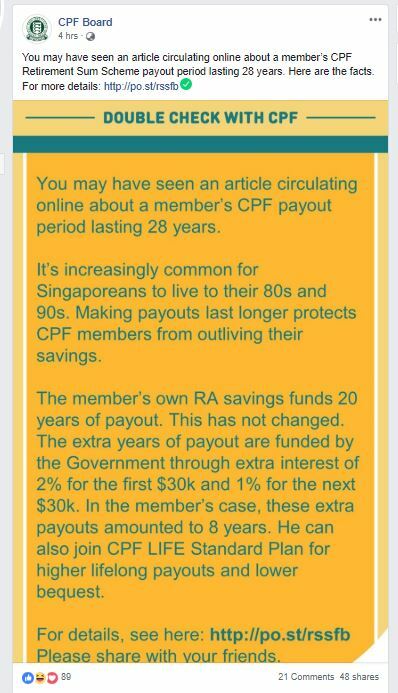 The CPF Life payout is also almost the same as the 20 years fixed 4% simulated payout too. While there may be some inconsistency, very likely it is just some miscommunication. The calculations above shows that it is probably better to sign up for CPF Life. In any case, what is for sure is that CPF monies are often a very small part of an individual networth anyway. I always tell my clients that CPF serves to provide for some very basic needs of Singaporeans. Thus, the amount in CPF is actually very little compared to a person’s networth. We still need to do our own financial planning. It is better to channel the energy to built our wealth on our own instead of focusing on what is not productive.